Folks, you have no idea how much I've struggled with topics on this blog. I don't want to bore you with business details all the time - though it totally excites me, I realize it's not for everyone. Some of my best posts have been just relating to regular old life. So I hope you will start noticing the changes (and randomness) I will exhibit over here. It's just going to be life (and maybe a touch of self-promotion sprinkled with Monkey Toes cuteness)...Hope you enjoy! I know EVERYONE struggles with the age old question "what's for dinner". It's right between "Are we there yet?" and 5 minutes into a car ride with "I have to go to the potty, can we stop?". Over the past year my husband and I have been really working hard to plan out our weekly meals. We've tried grocery shopping for 2 weeks worth of meals (talk about a lot of bad produce) and shopping randomly, ending the day standing in front of the refrigerator (usually starving) and wondering what we will be doing with a combination of pickles, lettuce, peanut butter and leftover spaghetti (sounds like a pregnancy craving, not dinner). This is what we've turned in to - planning out one week at a time on a calendar. But honestly, I think we could be even better than that and I've found a solution I'm going to work into my weekly meal planning. - The Organized Cook. 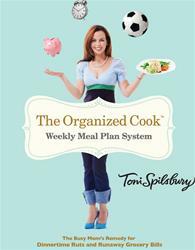 Toni Spilsbury, the actual Organized Cook, generates weekly meal plans, keeping the kiddos in mind. She plans everything from your grocery list to the initial meal to what to do with the leftovers - love that! In my opinion, Fall is the best season to do this. We utilize the CrockPot a LOT (actually year round, I love it that much). One of my favorite things to let stew and simmer in the CP is chili. Sunday afternoon chili...mmmmm. I've got several recipes, but one of my faves (which always receives a ton of compliments) is the actual Wendy's Chili recipe. In a frying pan, brown the ground beef, then drain off the fat. Put the beef and the remaining ingredients into a 6-quart pot. Cover the pot and let the chili simmer for 1 to 1½ hours, stirring every 15 minutes. You an also put this in the crock pot on low for 3 to 4 hours while the chili simmers. Pair it with corn bread and stick a fork in me, cuz I'm done. We usually double up this recipe so either we can freeze it for another day or eat it all week long. But Toni has gotten me thinking about how to utilize it in another meal - Chili Dogs, Chili Cheese Nachos, Chili with my eggs in the morning (oh I'm drooling now), drain the liquid off and make burritos or serve it over Indian Flatbread and top with taco goodies. I could go on all day. All of these would be fabulous dishes for Halloween night trick or treating too, keep those bellies warm and full. I'm excited to join Toni Spilsbury on a Twitter discussion about Fall Meal Planning this Thursday, October 20, 2011 at 8 pm MST (10 pm EST). Interested in joining in on the Festive Fall fun? RSVP here before the party (or during, if you're a procrastinator such as myself). When you RSVP, you do enter yourself into several great drawings. What are your fall food traditions? Disclosure: Monkey Toes and The Organized Cook are not affliliated in any way shape or form, though I (Jenny) love the program so much I am using it myself. I am being compensated for this post, all opinions are my own. i struggle with this all the time, too. i am the worst when it comes to meal planning!! i go to the grocery store almost everyday! ridiculous, I know. one thing i know we have a lot during the fall is soups that are easy to put in a crcokpot. and lots of stews or roast. Since my first job was working for Wendy's near the headquarters of Columbus, OH, I approve of this recipe! And I love that you've adapted it for a crock pot. Honestly, I loved the original recipe (prior to the addition of green pepper and have no idea if it can be obtained from the web or headquarters, but I will now try!) You've inspired me. When I worked there, I would put an open-faced single w/cheese on a salad plate, smother it in chili and be in heaven. I always told them they should put it on the menu. I was 16-18 and in drill team - those were the days I could eat this every day and not gain a pound. But I like Toni's ideas to reuse the chili throughout the week. Bonus.